Our home and office electrical systems are what makes our daily routines possible. And without a proper electrical wiring inspection, it will only be a matter of time before something malfunctions and we literally get left in the dark. The quick and skilled pros at Fantastic Handyman will readily provide your property with a reliable house wiring, quality exterior lighting, and any kind of electrical repairs you may need. Booked 3 hours, but the job took 2? No worries, you only pay for the actual time, the service took, upon job completion. Minimum appointment time: 1 hour. After the first hour, we will charge on a half-hour basis. Prices are inclusive of all taxes. T&C and Minimum Charges apply. When we calculate the price, we also take into consideration the area’s dimensions and the time of the appointment. All prices and deals are valid for areas within M25. Deals cannot be combined with any other deals and promotions. Prices are subject to availability. Congestion charges are excluded (when applicable). - Book all other Fantastic services with 20% OFF - from Handyman and Gardening to Pest control and Waste removal. - Get access to member-only slots and exclusive deals with up to 40% discount on special occasions (like Black Friday, Cyber Monday etc.). - Cancel or reschedule your services at any time, without any fees. Electrical tasks, such as rewiring a lamp, are famous for holding many risks. To ensure that your lighting repairs session will go as smoothly as planned, both your own safety and that of the specialists will be completely guaranteed by a comprehensive insurance plan of up to 5 million GBP. If you are not exactly keen on frying all your electrical equipment or radically changing your hairstyle, then it's best to leave all repairs at the hands of a competent and qualified fantastic electrician. 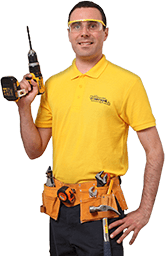 The London specialists at Fantastic Handyman are responsible, polite, and most importantly qualified electricians, meaning that they can easily handle tasks ranging from light switch repair to installation of modern indoor lighting. No matter what type of artificial light sources you are trying to set-up or repair, your lighting technician in London will always know how to make it all work. The pro can provide your office with elegant task lighting and outfit your living room with halogen lighting. Or install fancy up-lighting in your man cave. Or link a few HMI lights or a LTM lighting system to your power grid. And when it comes to electrical repairs, the expert will happily aid you with chandelier, hmi, antique lighting repair, and much more. Cleaning the cut wires, torn packaging, and layers of dust that often come with this sort of electrical work is not exactly something that you want to do on a cold Sunday afternoon, or on any day for that matter. But rest assured, because your lamp fix session is guaranteed to go in your favour. Once all lamp repairs are done, the experts will responsibly clean and dispose of the debris for you. This way, you will have the extra free time to enjoy the new stylish lighting at your home or office. Your service guarantee will kick into effect as soon as all light repairs have been completed. Sunny Mondays, rainy Saturdays, lazy Bank Holidays – whenever you need lamp rewiring, Fantastic Handyman can readily deliver it. We cover all areas within London's M25, and a quick call on 020 3404 4045 is all it takes to arrange an appointment. Alternatively, you can stop by our online chat, book online via our easy to use booking form, or download the GoFantastic app to book lighting repair and many other home-office services with a single tap. Set up your own handyman franchise business with a minimum investment. Get guaranteed work by becoming a Fantastic Services partner. GoFantastic is the first London app to instantly book any service for your home, garden and office from just one company.